Join the discussion forum to ask questions, make comments, vote in polls, rate your favourite tequilas and mezcals, read up-to-date industry news, or simply meet other tequila and mezcal aficionados. You can buy tequila in literally hundreds of places in any Mexican city, town or village, including pharmacies, grocery stores and specialty outlets - licorerías. Local corner stores as small as a closet usually have a selection, which may be surprisingly better than that in some large shops, and a lot cheaper. There is also a reasonable selection of tequilas in airport Duty Free shops. Mezcal is the drink with the worm - not tequila. It's almost impossible to disassociate mezcal today from the worm, although it is a comparatively recent relationship, and not a traditional accompaniment. In 1995, some mezcal producers began a movement to ban the worm, but others rejected the idea, worried that North American buyers would miss it. They feared that the worm had become so entrenched in urban mythology that consumers in North America might reject non-worm mezcal as not authentic. So pervasive has the worm identification become that it has also tainted its sister, tequila. The fight went all the way up to Mexico's federal government, and eventually the Mexican Health Department decided the worms are safe for human consumption, so it allowed them to stay. The movement to ban the worm lost steam and was pretty much forgotten by 2005. "The worm draws your attention," said Celia Villanueva, the founder of Houston-based Mexcor, which distributes the Lajita brand of mezcal. "It's popular with young people." Called a gusano, gusano de maguey or even gusanito ('little worm'), it is actually a caterpillar of a night butterfly (mariposa), not a worm at all. It feeds on the plant (both cultivated and wild varieties). Or at least some of the brands have it - most premium mezcal distillers don't put one in the bottle. Certainly Mexicans don't seem to drink anything with a worm, and homebrew or local mezcals never have it. There are two different types of worm in mezcal - red (rojo - considered superior because it lives in the root and heart of the maguey - colloquially known as the chinicuil) and the less-prized white or gold (gusano de oro), which lives on the leaves. However, in some areas, the red is more numerous and harms the maguey more. The red gusano turns pale in the mezcal, the gold turns ashen-grey. 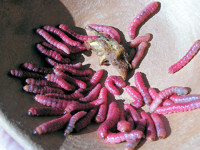 Both larvae are commonly eaten as food and are sold in Zapotec markets. According to some sources, the small (about 1" long) gusanos are cleaned, then soaked in a vat of water for a year. Wisniewski says they are soaked in mezcal, which additionally cleanses them of any materials and waxes that might affect the mezcal's flavour. Other sources say the gusanos are harvested in the rainy season only from the common pulque agave, and are washed, then cured in a solution of 47% alcohol to leach out natural fats, and moderate their taste. The other variety of "worm" in mezcal is the larva of a weevil known as picudo del agave, Scyphophorus acupunctatus, the agave snout weevil, that infest the yucca plant and certain species of maguey. They are not related to edible maguey worms of central Mexico. The weevil is a pest that can severely damage maguey and agave plants, although more by infecting the plant with harmful bacteria (erwinia, the cause of soft rot) than damage done by the weevil or its larvae. In some cases up to 40% of a maguey harvest has been be lost to weevil infestations. Infection-resistant varieties of the plant are being developed. Some mezcals come with a small pouch of dried 'worm salt' or sal de gusano, a mix of roasted (on the comal), powdered roasted gusano, chile pepper and salt. It's quite tasty with fresh lime and goes equally well with tequila and lime. Del Maguey's web site also notes that worms, lime, or salt are not traditionally eaten with mezcal. Legend and mythology have grown up around the gusano, successfully masking its true origin. Stories say Aztec priests added the gusano to pulque, and the gusano in mezcal continues that tradition. Other tales say it was used to test the strength of the mezcal in an age when innkeepers sold weak booze - the dead gusano proved the mezcal had enough alcohol in it. None of these tales has been proven through historical record. Another urban myth suggests the gusano has aphrodisiac properties (a claim also made for damiana flowers and liqueurs made from them). Some producers claim the gusano adds flavour to the mezcal, others argue it detracts from the mezcal's taste. While most mezcals for Mexican and North American consumption have a single worm, mezcals for the Asian market may have as many as five, one for each drinker. Japanese consumers seem among the mezcaleros' best customers. The worm is really a rather successful marketing ploy dreamed up to make one particular brand of mezcal stand out from other spirits. The practice of adding the worm was invented by Jacobo Lozarto Paez (also written as Jacobo Lozano Páez in some sources), in the 1940s or 1950s. You can read the story at www.mezcal.com/worms.html. Páez was an art student in Mexico City, who worked part time at a liquor store called La Minita, before he started working in a mezcal bottling plant. Páez had a spark of marketing genius by making a worms of feature of his mezcal, single-handedly creating an industry legend and mythology around the worm that quickly took off. Regardless of the origin of the tale, the butterfly has an ecological relationship with the agave that is symbolized in the gusano in the bottle. According to Wisniewski, the gusano is harvested both by mezcal distillers and by Zapotec Indians who sell them to the distillers and restaurants. He says some distillers, like Monte Alban, harvest only those that live on their agaves and let some live to perpetuate the species. Ron Cooper contradicts this statement. The butterflies are apparently declining in numbers due to the growing mezcal industry, and unless conservation efforts are made, could become extinct within a decade. Mescal Lajita says harvesting the caterpillars ('innoque' gusano, or by its Latin name: Chilocuil cossus redfernbachi) is very labour-intensive: the creatures must be plucked whole from the maguey without damaging either them or the plant. Harvesting is usually done in the rainy season (June-September) when the caterpillars come out of their burrows in the leaves. Reluctant worms are prodded out with the sharp thorns of the maguey. Prices for worms range from $0.20 to $0.40 US each - and with 200 to 500 worms in a single infected plant, it can be a major income for local families. Many of the caterpillars end up in local markets where they are sold for food. 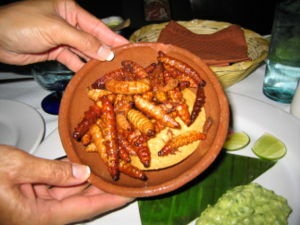 The protein-rich gusano is considered a delicacy in many Oaxaqueño recipes. So popular have the gusanos become of late that mezcal producer Beneva sends security guards into the agave fields during the rainy season to stop worm poachers. The gusano is harmless - it does not contain any psychotropic or psychedelic properties despite the urban legends. It contains alcohol and protein (58.3% protein and 30.16% fats and oils). It is not a drug or a an aphrodisiac. Eating it is a rite of passage for many college sophomores - but more important, the gusano have been part of the local Oaxaqueño cuisine since pre-Columbian times.